SpaceX's new upgraded Falcon 9 rocket undergoes an static fire engine test on Sept. 19, 2013 ahead of a Sept. 29 launch testfrom Vandenberg Air Force Base in California. The private spaceflight company SpaceX is counting down to launch its first rocket from California today (Sept. 29) in what will be the debut flight of the firm's upgraded Falcon 9 rocket, and you can watch the liftoff live online. The next-generation Falcon 9 rocket is slated to blast off from SpaceX's launch pad at California's Vandenberg Air Force Base on a test flight that will also carry the new CASSIOPE space weather satellite into orbit for the Canadian Space Agency. Liftoff is targeted for 12 p.m. EDT (1600 GMT/9 a.m. PDT). An upgraded SpaceX Falcon 9 rocket stands poised to launch from Space Launch Complex 4 at Vandenberg Air Force Base in California in September 2013. Liftoff set for Sept. 29, 2013. In addition to launching the Canada'sCASSIOPE satellite, SpaceX hopes to test ground-breaking new reusable rocket technology during today's test flight. The test, which will occur after the Falcon 9 rocket's first stage separates from its upper stage, is designed to test post-launch rocket booster maneuvering for future reusable rockets. "After stage separation, the first-stage booster will conduct a retro burn to reorient and slow itself, before re-entering Earth's atmosphere," SpaceX spokeswoman Hannah Post told SPACE.com in an email. "It will then conduct a second burn to further reduce velocity before splashing down in the Pacific Ocean. It is important to note that this is not a priority for this flight and SpaceX does not expect success with this first test." Elon Musk, SpaceX's billionaire founder and CEO, has said in the past that his company is actively pursuing a completely reusable rocket launch system. That system includes flyback rocket boosters capable of vertical landings. The company has even developed an innovative reusable Grasshopper rocket prototype, which has performed several spectacular test flights at the firm's McGregor, Texas. "The site's location on the California coastline provides access to high inclination and polar orbits, frequently used by satellite communication constellations, defense intelligence and Earth-observing satellites, and some lunar missions," Post explained. SpaceX is using Space Launch Complex 4 at Vandenberg, which was first used for Atlas rockets in 1962 and later used for Titan 4 launches until 2005. SpaceX completed its modifications to the launch pad in 2012 and plans to use the site for Falcon 9 launches, as well as its planned mega-rocket, the Falcon Heavy. The upgraded Falcon 9 rocket is also SpaceX's first Falcon 9 flight not dedicated toward the firm's Dragon space capsule program. The first Falcon 9 test flight in June 2010 carried a mockup of the Dragon capsule, will full-up Dragon spacecraft riding on later versions. The new circular Octaweb engine arrangement of SpaceX's nine Falcon 9 Merlin 1D engines is seen in this image. SpaceX's Falcon 9 rocket is a two-stage launch vehicle that stands 224.4 feet (68.4 meters) tall and is powered by nine Merlin engines also developed by the company. The new upgraded version launching today is powered by SpaceX's new Merlin 1D engines, which are capable of providing about 1.5 million pounds of thrust in a vacuum, a 50 percent increase from the baseline Falcon 9, Post said. The new Falcon 9 carries more fuel for those engines and is also equipped with a triple-redundant avionics system and a more durable first stage to help the booster better withstand its re-entry into Earth's atmosphere, she added. The new first-stage Merlin 1D engines are also arranged in a circular pattern called the "Octaweb," with eight engines surrounding the ninth engine in the center. Previous Falcon 9 boosters arranged the first stage engines in a three-by-three grid. "The new layout also provides individual protection for each engine, and further protects other engines in case of an engine failure," SpaceX officials explained in a mission description. "With this design, Falcon 9 is also prepared for reusability — the Octaweb will be able to survive the first stage’s return to Earth post-launch." SpaceX named the Falcon 9 rocket after the fictional Millennium Falcon from the "Star Wars" films, with the "9" designation stemming from it nine-engine configuration. Dragon space capsules are named after the "Puff, the Magic Dragon." If all goes well, the new Falcon 9 rocket should deliver the desk-size CASSIOPE space weather satellite into orbit about 14 minutes after liftoff. Built by the Canadian Space Agency, the 1,060-pound (481 kilograms) satellite will study how solar particles from the sun interact with Earth's atmosphere during space weather events. It includes special cameras to observe the auroras at the Earth's pole created by this interaction, CSA officials have said. SpaceX is also launching three smaller satellites into orbit with the CASSIOPE spacecraft. They include: CUSat, a GPS technology demonstration craft built by Cornell University; DANDE, a small spherical spacecraft built by students at the University of Colorado at Boulder to study atmospheric drag on satellites; and POPACS, a privately funded cubesat mission to study the effects of solar flares and eruptions in Earth's upper atmosphere. 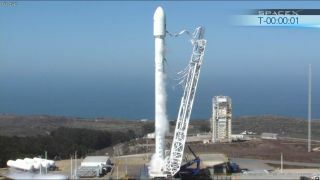 Visit SPACE.com for updates on the SpaceX next-generation Falcon 9 rocket launch. SPACE.com partner Spaceflight now is also offering updates via its SpaceX Mission Status Center, which will also include a launch webcast. Email Tariq Malik at tmalik@space.com or follow him @tariqjmalik and Google+. Follow us @Spacedotcom, Facebook and Google+. Original article SPACE.com.